interacto.net - UNO 1.3 Now Available! After a complete absence of theming solutions for the new Intel based Macintoshes, UNO is back! Due to recent developments posted at White Magic Labs , UNO could be ported to the new machines' chip architecture. The latest turnaround concerning some metal windows UI in Mac OS X (note iTunes 6, iLife 06..), brought to life the newest UNO incarnation: UNO shade - a slightly darker variation. So UNO doesn't change iLife apps, but it matchs it. It's your choice.. The new Customize Panel alows selective install, and themes mixing capabilities supported by a Live Preview feature. You can assign any variation of UNO and/or the default Aqua UI look to diferent GUI elements. - Universal Binary! 100% compatible with your brand new Intel based Mac. - Customize panel with live preview. - "guifix", a troubleshooting restore option ala ThemeChanger's "tcfix". - UNO is now Universal Binary (ready for Intel/PPC architecture based Macs) - thanks to Colin Cornaby for Extras2Extras2. - Introduced UNO shade (a slightly darker variation of UNO). - New customize panel with live preview (it is now possible to, optionally, assign any variation of UNO and/or the default Aqua UI look to diferent GUI elements. Overall GUI contrast can be achieved by mixing UNO with UNO shade). - Uninstall should now be fail-proof. Added "Uninstall" in addition to "Restore from Backup". - Merged iTuno with UNO (UNO concept is now ONE download). 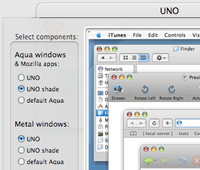 - UNO is rebuild against new UI resources file (requires Mac OS X 10.4.4 or later). - Changed OS version check method (some Tiger systems upgraded from Panther were being miss identified as 10.3). - Added iTunes version check (requires iTunes 6.0.2 or later). - Fixed iTunes bottom corners - thanks to Ephica (were a bit jagged). - Added compatibility with Firefox 1.5.x and Thunderbird 1.5.x. - Reduced Spotlight and Apple menu items size by 20%. - Enhanced UNO integration with Firefox to be more compatible with 3º party themes - thanks to Aronnax. - Reduced the slightly dimmed title text on some metal windows (reduced, not fixed). - Fixed a tone mismatch between text background and window background (was notorious at iTunes advanced preferences panel; WorkStrip about panel; ...). - Fixed a glitch found on metal drawers (a horizontal gradient overlay was present). - Added Install, Uninstall, Restore from Backup, Remove guifix and More Info menu items. - Other minor installer enhancements.